Treat yourself to the convenience of Amish furniture that is updated with modern amenities. Our Amish Classic Mission Rectangular Coffee Table with Lift Top features timeless craftsmanship that is built to last in your home for decades. Enjoy expert woodworking coupled with an updated design. 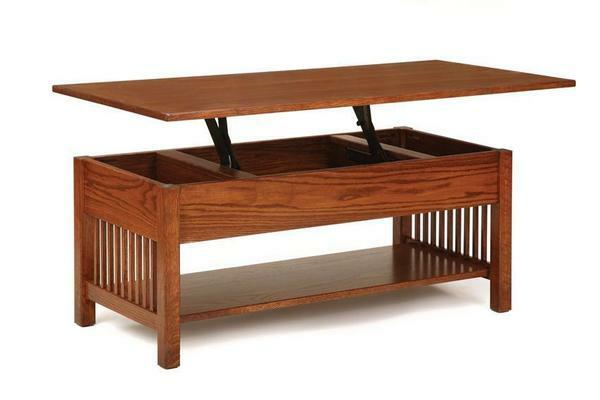 This Classic Mission Coffee Table with handy lift top is handcrafted of 100% solid oak, cherry, brown maple or quartersawn white oak. The unique lift top allows you to move the coffee table closer to you for eating, playing games, or using your laptop. Feel good about making use of a coffee table that is made right here in the USA. Lancaster County, Pennsylvania to be exact. Our customers love this Mission coffee table and we can see why! We'd love to hear from you. Please call one of our Amish furniture specialists with questions or ordering assistance on our Mission Furniture at 1-866-272-6773. Should you find yourself in the Sarasota, Florida area, we'd be delighted to meet you in our Amish furniture store. There we have a snapshot of the wide range of handmade items you'll find here on our website. Stop in anytime to see DutchCrafters in person! Height with Lift Top Down: 19"
Height with Lift Top Up: 29"
They should have let the piece dry more before delivery, but I understand their rush to get it out when the pieces have a 6-8 week wait time. That is the only suggestion I would make. The piece is very well made.